Open the note. Click on Reminder button. Select Time Reminder. Using the calendar and the clock set the required date and time. If you need for the reminder to repeat after a certain period, click on Repeat and select the required period. To save the reminder, click on the checkmark. Open the note. Click on . Select Place Reminder. Select the required location on the map and make a long tap on it. The blue pin should move there. To save the reminder, click on the checkmark. Move to a place. To save the reminder, click on the checkmark. How do phone reminders work? It's quite simple - you create a phone reminder for the required note and type in the phone number (or choose from the contact list). Upon getting the call, you will see your note. 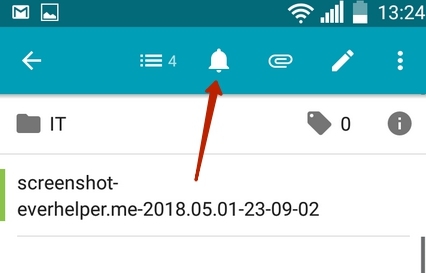 How to create a phone reminder? Open a note, click on and select Phone reminder. Then type in the phone number and click on the checkmark. Can I turn off reminder sound? Yes, you can. Just go Settings - Sound. Here you can turn off sound and vibration. How to delete a reminder? Open the note and click on the X next to the reminder name. Or open reminder settings, click on and then click on trash button.